Being on the ocean means being a part of the food chain. One Florida angler found that out when a shark leapt from the water and tried to take the sailfish he’d just hooked. I mean, yes, it’s competitive out there. While you and your angler buddies are sipping your beverages and watching your glass rods, prepared to leap up and reel in the big one, there are top predators just below you, hoping to do the same. With only their extremely efficient swimming, frightening sense of smell, outlandish speed, and razor-like abilities, both in reaction time and agility, sharks are the apex predator in the ocean. 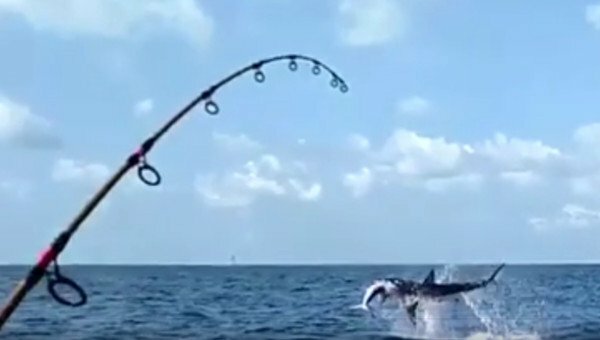 An angler named Mike, while fighting a to land a sailfish, had a big surprise when a 500-pound mako jumped into the air with the sailfish in his jaws. The video was posted to the “Bouncer’s Dusky 33” Facebook page and began going viral. Maybe the worst part is that the shark managed to chew the sailfish up, leaving only the mostly stripped carcass for Mike to bring it aboard, which he did much to his disappointment. But the value is that most fish stories are simply stories. But this one was caught on tape. So while others may not believe the yarns about a shark grabbing the fish before it makes it aboard, Mike has the proof. Watch below for yourself. previous articleWill Bass Pro Shop Gobble Up Cabelas?